Don’t miss out on this opportunity to hear four of the world leaders in the Low-CarbHigh Fat eating science present at The Noakes Foundation fundraiser this October. Join us for an evening exploring what is needed to change the diets and health of the future by four experts in diet, nutrition and human health. On the 26th of October 2016 The Noakes Foundation will be hosting a fundraiser that will feature fourof the most forward-thinking LCHF experts from around the world. 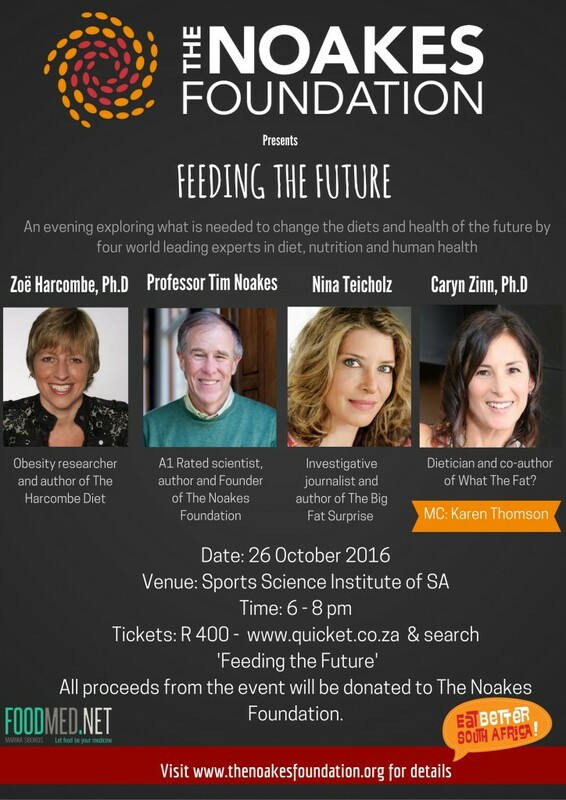 Professor Tim Noakes will take to the stage with Nina Teicholz, author of the international bestseller The Big Fat Suprise, Zoe Harcombe Ph.D, a nutrition and obesity researcher and expert, and Caryn Zinn Ph.D dietician and nutritionist and co-author of What the Fat? Karen Thompson, creator of The Sugar-Free Revolution, will MC the evening. The event will be held at The Sports Science Institute of South Africa in Newlands, Cape Town. The theme of the evening will be ‘Feeding the Future’, talks will focus on the problem with the current dietary guidelines in South Africa, the United States and the UK. Teicholz, Zinn and Harcombe are set to testify at Professor Noakes’ HPCSA trial when it resumes towards the end of October – their talks will also touch on the various highlights from the trial, giving the inside scoop on proceedings. This is an opportunity not to be missed. Secure your tickets now by clicking here. All proceeds from the event will be donated to The Noakes Foundation.